Jane got a great new bear from the paci fairy and Jill likes it a little too much (for Jane's taste). Jane doesn't like Jill to play with it so she will say, "No Jillybean that is a special bear" and then she will go hide it under a blanket in her room. "Gosh, I love this bear"
Today my jillybean is seven months old! She also has become a master at the walker. She can use one foot to turn left or right. She can go backwards or forwards. Pretty much she can get anywhere she wants to in our house that doesn't have carpet. 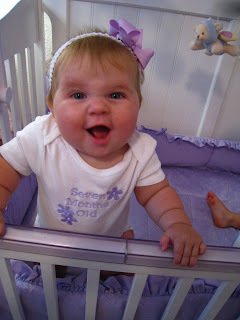 Also, she has TWO teeth coming in on the bottom (her first teeth). She has been a tad bit more whiny while teething, but not too bad- especially for her first two coming in at once. They have already broken the surface but no luck on getting pictures of them- she doesn't even hardly let me look in her mouth much less take pictures of it! 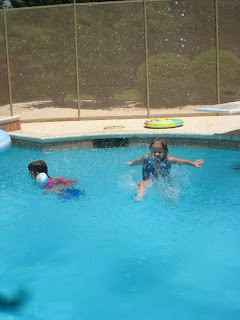 Saturday morning we were lured away to the Hollis' pool by the nice weather (I think it was like low 90s). We spent most of the day over there. Then after a few hours of actually cleaning out the garage on Sunday we decided we needed a break so we went to a water park. We went to a new one Jane hadn't been to before and it was a great time! Oh well, maybe we'll get to the garage next weekend? Here are some pics from the Hollis'. Nancy, Richard, Jay and I were having diving competitions and I think Jane must have got some idea about it because at one point she got out of the pool all on her own without anyone asking or telling her to and walks over to the diving board and yells from the edge, "Wook at me!" and jumps off! We couldn't believe it. Of course if we had asked her to do it no way would she have but when she gets an idea to do something herself there's no stopping her! After she jumped she says, "I am not afraid!" She jumped in a couple of times after that and I got some pics. 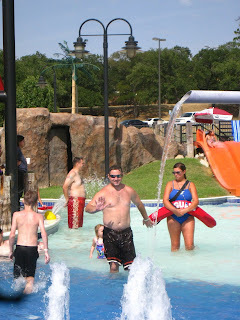 Here are some pics from Sunday at the water park. Jay and I took turns going down the big water slide. It was the kind with a tube that dumps you into a big bowl and then dumps you into the water. Monday was Jane's actual birthday and even though her party had passed she still had more celebrations ahead! 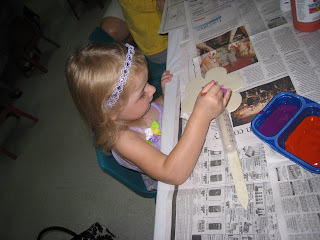 The day started with her very first art class. We actually were supposed to start last week but I totally forgot! When we got there the teacher commented on how nice Jane looked and asked where she got her headband and I said she got it for her birthday and that actually today was her birthday so her teacher had her stand on a stool in front of the whole class while they all sang happy birthday to her- for her FIRST class! 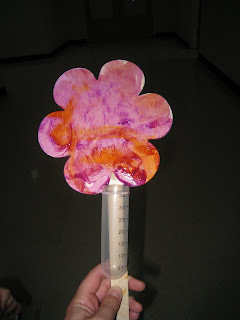 Now, those of you who know Jane know that this was actually more of a punishment than a treat (even though the teacher was trying to be nice). She had a pained look on her face like "when will this stop?" but she got through it all the same. Jill seriously thought the icing on Jane's head was so funny. She was laughing out loud at it the whole time Jane kept it on her head. Later that evening we all went over to my parents house. My dad made steaks and my brother and his family came over too. Here is Monica and Jill. Stephen kept telling Jane it was actually his birthday and she would argue back that no it was HER birthday! Jane had another birthday cake and another candle to blow out. Who is more excited about the cake Jane or Carson? Then there were more presents to open. 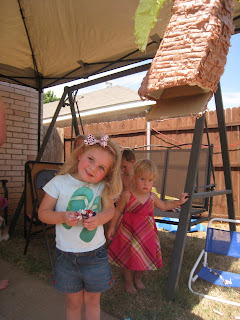 Carson played with Jane and her doll house. Carson's not much for attention- can't you tell? 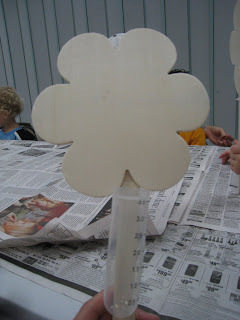 Jane started with her birthday dress which had a beach umbrella and flip flops on it to match her beach theme. Here she is greeting her friend Cooper. Pretty soon the kids were ready to get on their swimsuits and go on the water slide. Jane and Jennifer look ready don't they? Here is Christian and Noel (brother and sister). Cute huh? The kids had fun on the water slide I think. 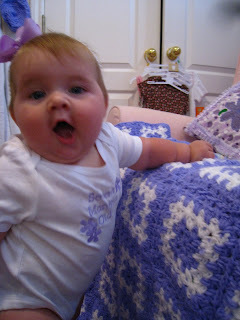 Can you believe little Sophia here is only one!?! She was hanging with the big kids (and holding her own I might add!). Here are some of the moms supervising (Suzanne, Janet, Jessica and Tracie). After water slide fun we had hotdogs and chips and banana pudding and fruit. Here are some of the boys enjoying lunch. That is Jake, Cooper, Drew and Ben. Of course Jane couldn't wait to open up her presents. She got so many great things! 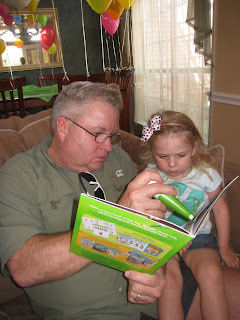 Here she is with her Pops- he is reading the electronic book he bought for her. 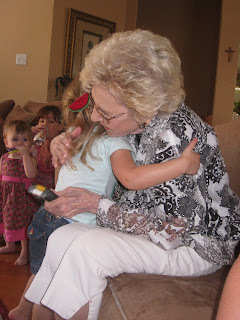 This is Jane thanking her Great Grandmaw (Meemaw Georgie) who got her a bag full of wonderful things including dinosaurs which Jane is really into right now. 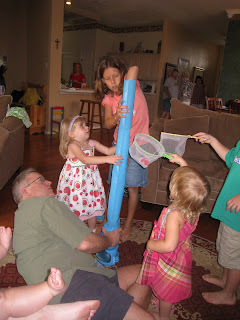 The kids had a lot of fun playing with the elephant butterfly blowing game Jane got from Elizabeth and Ben! 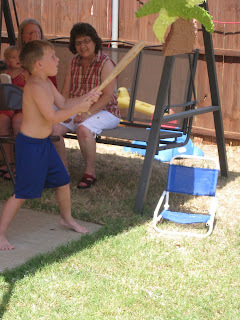 Even later we went out to hit the pinata. 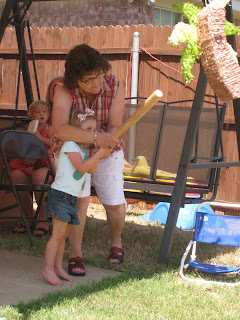 This is actually Jane's first time trying to hit a pinata because even though we have been to other parties with pinatas before she was too shy or scared to try. Even this time it was more Maw Maw than Jane I'm afraid. Then it was a candy free for all! This is Nikki, Jay's stepmom and Jill. Notice the water slide down in the background? At one point during the party we blew a fuse and had to do something with the breaker (I don't know what so don't ask! but whatever happened Jay and his dad and mine got it up and running again). This is my best friend from high school, Erin, and her awesome brood: Leslie, David, Kristen and Lauren. We haven't seen each other in more than a year or two so it was a real treat having them there! 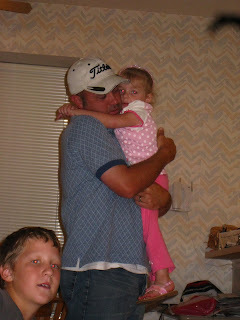 Paw Paw and his "Paw Paw girl". Here is Jacob and baby Elise, so cute! 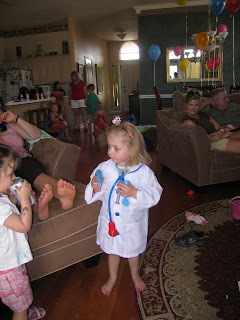 Jane LOVED the doctor kit she got from Erin and Sophia. After a LONG day Jill relaxed here with Meemaw Georgie and eventually crashed. Looks comfortable huh? HAPPY BIRTHDAY my big three year old!